View More In Routers - Page 3. 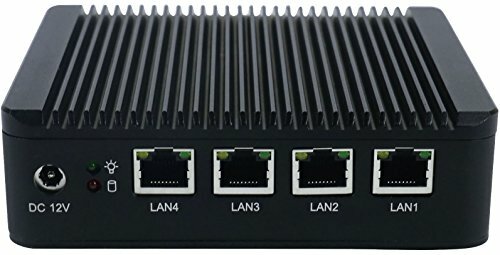 The Vault is a small form factor network appliance built for use as a firewall router and is compatible with a variety of open source firewall projects including pfSense, OpenBSD, VyOS, Security Onion, Linux, and Windows. The FW4A-0 comes without RAM or mSATA, so you can choose RAM and mSATA options that meets your needs. Tested compatibility: Most open source software firewall solutions, including pfSense, VyOS, OPNsense, OpenBSD, Security Onion, Untangle, CentOS, Linux, and Windows. Optional Wireless card available from Protectli. Card is USB Channel and fits in a PCIe form factor. This device is small and it's fanless, so there's no noise. The 4 Intel NIC ports are proven to be the most reliable for use with high throughput packet switching applications and the Vault can route at gigabit wire speeds (930Mbits per second as tested with iPerf). Use the 4 ports to configure different layers of security within your network for extra protection. Set up a VPN or Captive Portal. If you have any questions about this product by Protectli, contact us by completing and submitting the form below. If you are looking for a specif part number, please include it with your message.